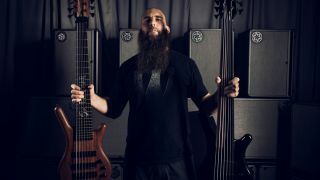 Jeff Hughell's 6 tips for bassists: "The wall of sound is good some of the time, but it’s also important for the bass to venture off"
As bassist for Six Feet Under, Jeff Hughell is known for his death-metal attack, which he unleashes on his custom Warwicks, particularly his seven-string bubinga Corvette. That instrument features prominently on his solo projects, including his latest and fourth release, Sleep Deprivation. Like its predecessors, and all of Hughell’s work, the new album is loud and relentless. However, it is rich in melody, percussion, funk, and jazz - the genre he studied on upright bass while in high school and college. Hughell also plays fretless bass on the disc, as well as electric guitar and piano. He is joined by his Six Feet Under bandmate Marco Pitruzzella on drums. “This album has a little bit of a different edge,” he says, “as I played more guitar and keys, but at the same time I focused on expanding the bass sound. On top of layering bass parts and having an A and B part that talk to each other, I made all the bass stereo, which gives it a larger sound. Between solo work, collaborations, Six Feet Under, travel, sessions with other artists, family time, and owning/operating a tile contracting company - his “day job” when not on tour - Hughell stays busy all hours of the day and night, a playful reference in the album title. Asked to share some of his tips for bass players, and musicians in general, he covered everything from technique to surviving the road to navigating the current state of the music industry. “The main thing that bass players get away from, especially in extreme music, is the envelope of the low-end coming through. The most important thing, to me, is holding down the low-end and making sure the heaviness comes through, because the more notes you play, the less the low-end is actually resolving and coming through people’s speakers. “With my solo stuff, I obviously have the luxury of being able to play lead lines on top while still having the bass there, so I play a lot of notes and a lot of stuff that doesn’t have a lot of low-end with the seven-string bass. But when I’m playing in Six Feet Under and in other bands, I am always mindful of having that low-end. ”There’s a 'wall of sound' method that came out with thrash metal, meaning that the bass player is playing exactly what the guitars are playing so it’s all one big, heavy unit. That’s good some of the time, but it’s also important for the bass to venture off in between with the drums, follow the drums at certain times, and leave things open at certain times, to really make the bass effective and to play with the song. ”There are so many techniques that bass players now use. There’s a lot of tapping and slapping and double thumb, and those are really cool to learn, but there’s a time and place for them, and it can be hard to find when they perfectly apply in a song. ”Again, I have the luxury of doing solo stuff, and I can get out all of those techniques in the way that I want to do it, so I’m not anxiously trying to shove them into songs they don’t work for. ”Practice is the time to be creative by yourself, work on those things, and over time you’ll know when and where to use them. I use Logic, and it comes with all these different loops, so you have different styles, time signatures, and keys. It's good to just go in randomly, grab a loop, and start improvising to something you’re not familiar with. ”A lot of the traveling can be grueling, and you can lose your patience. There are uncomfortable situations left and right, but you have to go with the flow. In Six Feet Under, we have the luxury of nice tour buses, but it’s still not the comforts of home. You’re playing in dirty clubs, showering at venues, using a bathroom that 30 other people just used, and it's quite unpleasant, but if you want to be out on the road, those are the things you have to deal with. ”We’re at a point now where we’ve got a bunch of guys in the band who are easygoing. You have to be easy to deal with in order to make it in the touring life, and you have to respect other people’s space; otherwise you’re going to bump heads with each other. Some of the bands we’ve toured with, it’s their first time touring and it’s, 'I need my exact amp,' or 'I need my whole drum set,' this and that. It doesn’t work that way. ”Especially when you do fly-in festivals, sometimes you get the gear they have and that’s what you have to use. You just have to go with it. You have to be able to adapt to get through it. But at the end of the day, it’s all about playing live. That’s why you do it. That’s why you leave home, miss your family, miss everything that’s happening at home and all those comforts. ”Should we talk about the present state of music and how people consume it? That uncomfortable situation? I put out an album in 2013, one at the beginning of 2016, and now this one. Just the evolution of sales as far as people buying physical CDs - I saw a massive decline from 2013 to 2016. It was less than half, numbers-wise, and it’s dropped even more now. ”People aren’t purchasing music like they used to. Everyone uses Spotify, and Apple Music and YouTube want to compete with that, so with Apple Music you pay $9.99 a month and you can download anything on their entire iTunes library. If your stuff is on iTunes, someone can download it and you’re getting paid as if they streamed it once. ”I was at NAMM when my album came out, and when I told people I had just released it, they pulled out their phones and downloaded the whole thing immediately. I’m not getting paid anything, but at the same time, they’re checking out my music. ”It’s painful for the artists, so there’s two ways you can go. Either you do what I did and have it available so everybody can check it out, or you don’t put it on any streaming sites and only put it on Bandcamp for people who pay for it, and they can buy a CD directly from me. But, unless you’re a huge act, that’s kind of shooting yourself in the foot. It’s better to have it out there for everybody to enjoy, because, once again, it’s about the music and people enjoying what you do. Sleep Deprivation is out now.